I'm thinking of traveling to Aleppo, Syria (from Boston) and have questions about it and how to convince my family to come with me. (background to show why it's so important) My Armenian great-grandparents and great aunt left Aleppo, Syria around 1912. My great-grandmother's brother came later, but no one else ever came and they did not return. Great grandmother died young. In 1972 my grandmother went to Beirut (Syria was too dangerous at the time, she was told) + met one of her mother's brothers and his two sons. She died too young and we lost contact with all of them. Thirty years later, I found those two sons (thanks, Internet)--still in Aleppo. I correspond with one--he mailed me all of the letters my grandmother had written him. It's so amazing, I can barely believe it's true. It's like I found a hole to the past. I'd like to visit. I'd like my mom to come. I'm trying to propose a trip to her, but every flight I find costs $1700 and seems to have 5 stops. I don't even know what's typical. And then I can't figure out if it's best to fly to Damascus and train to Aleppo or straight to Aleppo. We only speak English, save for tiny bits of Armenian--I'm assuming this is ok? I will have my cousins there, so that will help. I'd also just like to hear anecdotes about folks who have gone to Syria and had a great time so I can convince my mother not to be scared to travel there. Thanks very much. Wouldn't it make more sense to travel Boston--Istanbul--Aleppo? I spent a week in Aleppo a couple of decades back and had a wonderful time. My wife and I stayed one night in the Hotel Baron for the history ("Lawrence of Arabia slept in room 202; King Faisal declared Syria's independence from the balcony in room 215; Agatha Christie wrote the first part of "Murder on the Orient Express" in room 203... Other notable guests include Dame Freya Stark, Julie Christie, Mr and Mrs Theodore Roosevelt, Kemal Ataturk, Lady Louise Mountbatten, Charles Lindberg and Yuri Gagarin") and fine Armenian brandy, then moved to cheaper digs. We took a lengthy tour of the Armenian Quarter and listened to a priest chant (and put money in the collection jar), took the Citadel tour (unbelievable place), spent plenty of time in the souk (huge! ancient! Bedouins wandering around! ), and took a day trip to Qal'at Sem'an (my wife loved Simon of the Desert and insisted on seeing the stub of his pillar); the guide who attached himself to us hit on my wife a little, but in a gentle and noninvasive way, and she found it more charming than outrageous. I've been urging people to visit ever since (Americans seem to think Syria is just this side of Mordor, so it's a hard sell)—it's cheap, friendly, and spectacular, and there are hardly any other tourists—and if your family has roots there, I think they'd be nuts not to go, and you can tell them I said so. We went via Istanbul, Adana, and Antakya (Antioch) by bus, but that may be too long and no-frills for your family (though the long-distance buses are comfy and have refreshments). My friends who travelled there a few years back -- Palmyra, Aleppo, Mari -- agree on all this. They also noted that tourists were treated with friendly inquisitiveness, in part because there are relatively few of them, and that includes Americans. I just returned from Damascus a few weeks ago and loved it. I'm female and very American looking and felt totally safe (I'm a pretty seasoned traveler though... obviously you should be careful anywhere you go). There were plenty of tourists -- mostly Europeans. I didn't make it up to Aleppo, but if you have family there, I'm sure you will be well taken care of. All the Syrians I met were incredibly hospitable. I'm sure your cousins will be thrilled to pieces to host their American relatives. As for getting there, if you want to spend some time in Damascus (Old City is a must), another option would be to fly into Amman, spend a day there (or even go down and see Petra), and then take a private taxi to Damascus for $50-$75 or so. It's about a four hour drive to Damascus including the time it takes to get across the border. A taxi is how most locals go between Amman and Damascus and I'd be surprised if your cousins couldn't arrange a car for you. Between Damascus and Aleppo, you could take a train, but if your mother is skittish, it would probably be better to fly. I don't have first-hand experience, but I haven't heard great things about the trains (not that they're unsafe per se -- particularly if you have a private sleeper car -- just that they are unpredictable and not exactly comfortable). I hope you and your mother can make it out there. I've traveled throughout most of the Middle East for work and Syria is really a gem. Definitely worth making the trip -- especially since you have family there. That will probably make it an even better experience. Wow such good info already. Thanks so much everyone, now I want to go even more than I already did. And languagehat, I'll tell my mom you said so. Syria is wonderful. We spent almost a month there, including Christmas in Aleppo, in 2008. As others have said, the people were very friendly, even though we spoke almost no Arabic. Like languagehat, I can recommend the long-distance buses in both Turkey and Syria. (We actually rode our bikes from Antakya to Aleppo, but took the bus from Aleppo to Damascus.) My recollection is that the train in Syria is not recommended, but the buses are fine. Not quite the same level of luxury as Turkey, but certainly nicer than most buses in North America for the major runs. As zharptitsa mentioned, private taxis are also an option, and not terribly expensive. I'd recommend getting your cousins to set that up for you if you can though - they'll get a better deal, being locals and speaking Arabic. MeMail me for more details if you wish, or check out the blog for our trip - linked from my profile. Fly to Damascus (and see the city) and then fly from Damascus to Aleppo cheap on Syria Air. It's cheap and it is much easier on the weary traveler. You could rent a car and see some sights on the way, like the Krak . The Baron is not a great place to stay, but worth a tour. You should definitely stay at Beit Wakil for the full effect. It's in an old Armenian home in the Armenian quarter. It may have been YOUR family home! Reviews are all over the map, but we love it and my family always stays there. By all means you must hire a car and driver to take you to the Dead Cities. Syria is fantastic. Certainly one of the best places I have ever been on earth, no exaggeration. Aleppo is a working city, not quite as friendly as the rest of the country (still friendlier than anything in the West), but honest, genuine and unpretentious, sort of the Chicago of Syria. Checking out your blog, dttocs! And thanks Pollomacho - weirdly one of my great uncles ran a hotel in Aleppo (Bab al-Faraj is what my cousin says which I think is the old city), I should find out if it still exists. I just ran a random search for DAM to ALP round trip tickets and was surprized to see that they are running as much as $75! I'll second all the things about visiting Aleppo (and Damascus). 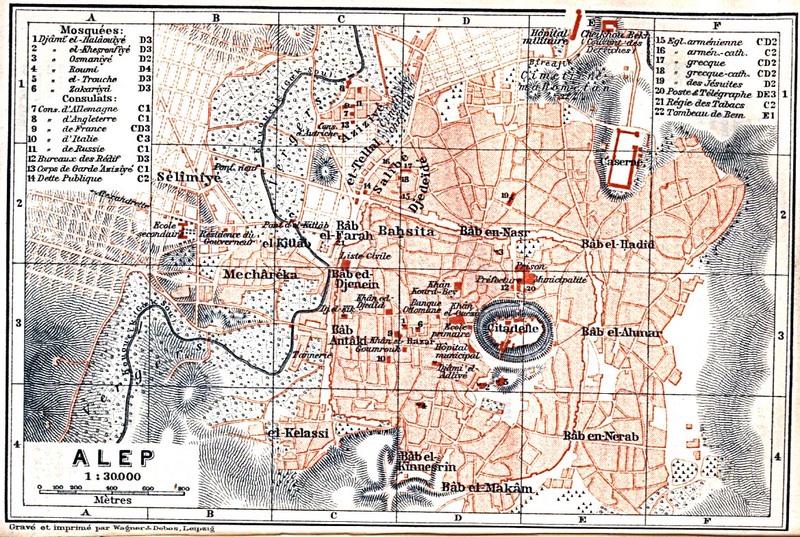 Here's a map of the city from the year your great-grandparents left; Bab al-Faraj is shown (as Bab al-Farah) in square C2. The 'Armenian quarter'--the part of the old city most associated with Armenians, though certainly not the only place in the modern city where Armenians live--is Jdayda, 'Djedeïdé' on this map, a very short distance to the north and east. There are still a lot of hotels in Bab al-Faraj, incidentally, some of them respectable, some of them distinctly less so. It seems pointless for me to add more specific sights in the city, or in Damascus for that matter, because some have already been mentioned (definitely Qal'at Sem'an) and others you can find through guidebooks. But one place you might like to see--and which your cousins might well take you to--is the stunning valley leading from the border crossing of Kassab down to the Mediterranean. The Turkish border passes (somewhat threateningly) along the northern slopes of this valley, which was excluded at the very last minute when the district of Alexandretta was ceded to Turkey in the late 30s. This was because it was (and is) mostly inhabited by Armenians. It's a popular weekend destination for Aleppines, especially Armenians--for others, too, of course, including vacationing families from the Gulf in small but growing numbers. High, limestone mountains with dark green forests and fruit orchards and a gorgeous blue sky and sea are not quite the mental image one has of Syria. I'm hoping this area won't be _too_ heavily developed over the coming years. Trains have apparently been upgraded recently between Damascus and Aleppo they're actually meant to be rather good. But certainly not very fast. Buses are regular and inexpensive--if you can, get them to show you a seating chart and don't take the seats at the back. And there's flying. Damascus and southern Syria are definitely worth visiting, but if you're short of time you might want to concentrate on Aleppo and the north. And if you would like any recommendations for places to visit in Aleppo, Damascus or elsewhere, feel free to drop me a MeFi mail. Oh--if you're not 'fixed' to a summer holiday slot, go in the late spring (April/early May) or autumn (say October). Your cousins will be able to give you advice on this. But the countryside is at its most beautiful in the late spring when there are a zillion wildflowers blooming. Sorry, should add: 'Bab' means 'gate', i.e. one of the old gates in the city walls, and by extension the adjacent quarter. For Bab al-Faraj, nowadays this seems to mean the area just outside the old walls rather than just inside. If I remember rightly. lapsangsouchong - thanks, most especially for that map!